Lusaka -The political tension in Zambia needs to be resolved for the common good and development of the country as it has the potential to derail all the economic gains made over the years, interest groups have contended, according to Southen Times, a newspaper funded by Robert Mugabe. Ghana and the World Bank said in separate reports that Zambia should seek to redress the political impasse that has divided the country, which poses a threat to peace and stability. Political tension has been on the rise following the 11 August 2016 presidential elections, which President Edgar Lungu won narrowly by 50.3 percent against his rival and opposition leader Hakainde Hichilema’s 47 percent. Hichilema has disputed the outcome of the elections, claiming he is the rightful winner. Political skirmishes have escalated between the government and Hichilema’s United Party for National Development (UPND) following his arrest and incarceration on 10 April on charges of treason. Several observers have called for dialogue to assist resolve the impasse. The aftermath of Hichilema’s detention has attracted the ire of interest groups including the European Union and the United States, who called for his release. 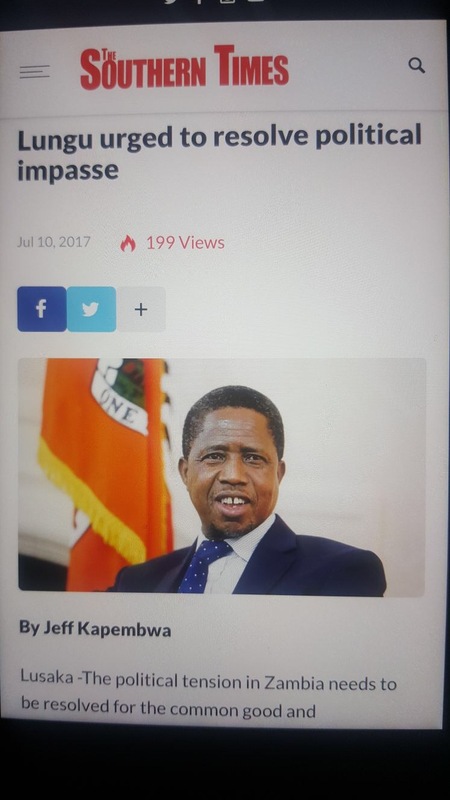 President Lungu has countered that the impasse of the popular opposition leader could only be resolved through the courts of law. While the church and various players in the country have tried to pacify over the matter, with all efforts falling through, some unknown elements have resorted to malicious damage to state property, with the recent incident being the plundering of electricity pylons and other national infrastructure, which the state has warned would be met with the wrath of the law. However, Ghanian leader Nana Addo Dankwa Akufo-Addo has advised political players in Zambia to quash their individual and partisan interests for the common good and development of the country. He said it was his desire to see Zambia proving that the leadership respects the rule of law while the citizenry should also show their commitment to upholding the dictates of the governance in place to allow for harmony to prevail in the country. Speaking during a state banquet hosted in his honour during a four-day state visit To Zambia during which time he officiated at the country’s trade fair, Akufo-Addo urged warring parties to reconcile their differences for the good of the country. “As political actors, whether in government or in opposition, we should prove to the world that we respect the rule of law and are willing and able to submerge our individual and partisan preferences for the common good in the development of our countries,” he said. His visit to Zambia, he added was “not to pass judgement, neither to find out who is right or who is wrong,” but that recent developments in the country, and the political tension that characterised the last election, where the margin of victory for the winner was some 100,000 votes, had left many worried, as Zambia’s democracy was one of the success stories on the African continent. President Akufo-Addo reiterated his persuasion that Africa was breeding a new generation of leaders “who are committed to governing their peoples according to the rule of law, respect for individual liberties and human rights, and the principles of democratic accountability.” The World Bank, noted in its Zambia Economic Brief report dubbed: “Reaping richer returns from public expenditure in agriculture” that Zambia risked losing all the gains made in recent years if the tension is not resolved urgently. According to the report, while Zambia’s economy has grown to a paltry 4.1 percent this year and poised to increase to 4.5 percent next year and increase further by the year 2019, there were fears of possible slippages that could even derail the envisaged US$1.6 billion needed from the International Monetary Fund (IMF) needed to prop the economy. However, President Lungu has dispelled reports of political tension rising in the country. He said that people calling for inter-party dialogue need to first tabulate issues they want to be discussed adding that it has been his desire for a long time to seek dialogue which some political parties who have not him taken seriously.